After having lessons from other local instructors – who I was not progressing with – I came across Rachel who I wish I found earlier! She was like a breath of fresh air who is calm and relaxed yet she pushes you with motivation and determination and encourages you to the point of perfection. She really has taught me safe driving for life and useful skills I will always remember. I would just like to thank Rachel for the patience she has had with me and the help and support she has given me from day one. It has been a long and tiring journey but she pushed me to always dust myself off and try again no matter how many times I got a manoeuvre or roundabout wrong. She has always stayed professional which is what I like best about her – she is always punctual, courteous and prepared for the lesson. I would strongly recommend her to others and have already done so to my family and friends; without a doubt an amazing and 1-in-a-million driving instructor! Wish you all the best with your career. I would never be able to thank you enough for helping me achieve a long-term life goal which means so much :-) x.
I honestly cannot rate Rachel enough. She has been the most amazing driving instructor I could ask for. Nothing has ever been a problem; she’s so supportive and kind. She instantly puts you at ease and calms your nerves. She helped me so much with my driving, helping find the best way for me to learn, even if that meant talking everything out loud! She always knew where I was with my driving, what needed more work, what was going great, and planned every lesson to best help me progress to my test. I’ve always felt relaxed during my lessons, and felt that even when things went wrong it was ok and she was there to calm me down and talk it through and made me ready to try again. I don’t think I could have learned to drive with anyone else. If you want someone supportive, kind and who genuinely cares about her students, go with Rachel you won’t regret it!! She’s amazing!! I’m already planning my motorway lessons with her. Learning with Rachel was great. She is great at assessing where you are at with things and planning lessons accordingly, and her in depth explanations help to fix any mistakes. I think the two-hour lessons also helped greatly in making progress towards my test. Overall an enjoyable learning experience with a friendly and professional instructor. Cheers a lot! Rachel went beyond what I would expect of a driving instructor. She always made me feel comfortable and at ease whilst driving. Rachel broke everything down so that I could fully understand every manoeuvre and mistake that I made so that I could correct what I was doing, showing the amazing patience she has. Before my test, Rachel made me feel at ease and made sure that I felt completely prepared. I can’t thank her enough for helping me pass first time and I would definitely recommend her! 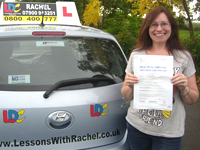 Rachel is an excellent and dedicated driving instructor, going above and beyond the call of duty to ensure you’re as prepared as possible for your test and driving safely beyond it. Every manoeuvre and procedure is carefully and patiently explained and illustrated in detail, as many times as necessary, providing the best understanding for a safe future on the road. You can tell Rachel genuinely cares about the progress of her students and will push you to the very best of your abilities, focussing on weaknesses in technique until they become strengths. 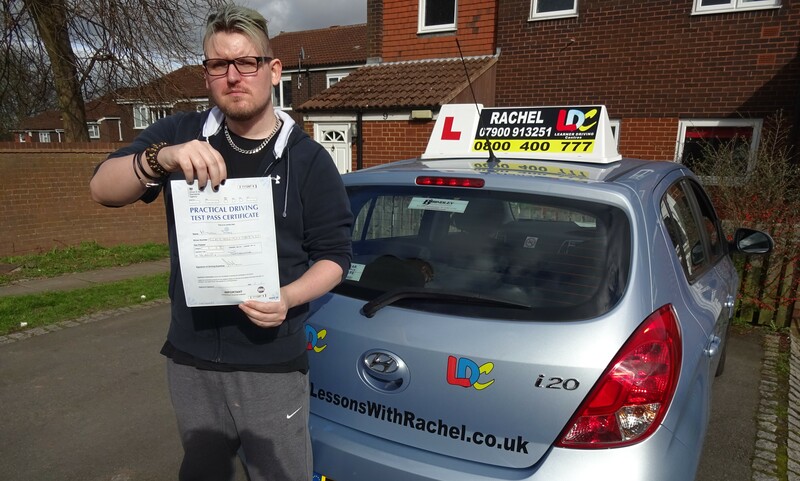 I don’t believe I would have passed first time with a different instructor and am glad I chose Rachel. Rachel offers a flexible approach to lesson schedules and I will be recommending her to all my friends who are looking to get on the road, just as I recommend her to anyone who is reading this now. Passed 1st time - ZERO FAULTS!!!! Thanks to Rachel, I managed to pass my driving test first time. She is highly professional yet comforting and reassuring when delivering her lessons. She's pushes you to succeed but always within your limits. Any weaknesses you may have she will continuously go through them with you until you manage to master them. 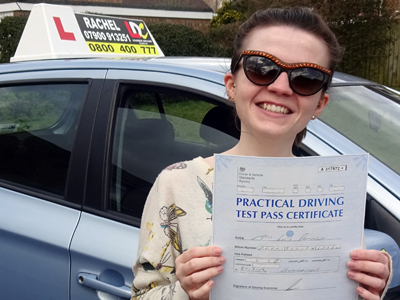 Not only does Rachel prepare you to be test ready, she also teaches you how to become a confident, and competent driver; allowing you to experience and drive in situations you wouldn't normally come across in your test. Thanks to her, I feel confident and comfortable in my ability to drive along various roads and places. I also feel that purchasing the LDC book and DVD combo will highly benefit an inexperienced driver as they include clear steps on how to master each stage of driving you'll learn throughout your lessons. 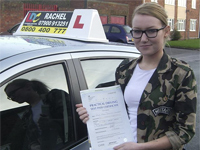 I would highly recommend Rachel to any learner driver. 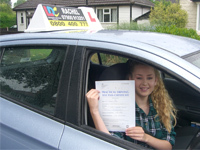 Rachel is a fantastic driving teacher who continually showed patience and support throughout all lessons. Her structured approach allowed a clear outline of what would be covered each lesson, helping me to develop key driving skills with confidence. 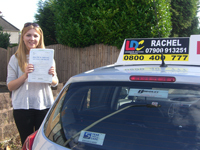 I would highly recommend Rachel as an instructor if you want to pass first time! 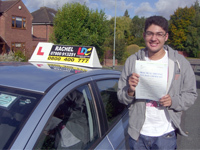 Rachel was very nice and friendly so I really enjoyed and looked forward to all my lessons. Rachel improved my understanding of the roads, made me a better driver, and went out of her way to make sure I got through my test first time. She is a legend! 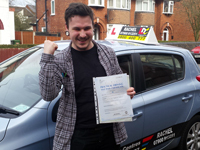 It had been nine years since last taking driving lessons, so I was conscious that I needed a new instructor who would be calm, understanding, reassuring, and of the highest standard. Rachel immediately stood out from all of the other potential instructors and within our first lesson, I knew I had made the right choice. The LDC Driving Skills Workbook/DVD combo were useful learning aids with an easy to follow weekly learning structure, but Rachel was always willing to go over anything I struggled with. Her constant professionalism and levels of patience were exemplary. 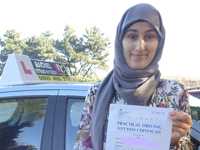 Furthermore, her supportive, upbeat nature helped me to build my confidence as a driver which, along with the skills acquired through the LDC learning system, prepared me for passing my driving test. 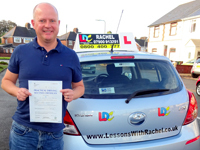 If you are serious about gaining your driving licence, just do what I did: trust your instincts and choose Rachel and her LDC driving school. You won't regret it! I passed my driving test with Rachel on 4th November 2016. I'd considered several instructors and chose well when I picked her! Rachel's patient and structured approach to learning were very helpful and it is clear that she is passionate about what she does. The learning aids were very useful and feedback that was given at each stage of the lesson was reasoned, informative and relevant. I feel that learning to drive with Rachel has prepared me for a lifetime of safe driving. 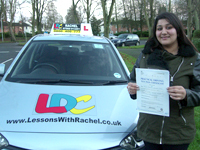 I would not hesitate in recommending Rachel to anyone in Wolverhampton who wants to pass their driving test. 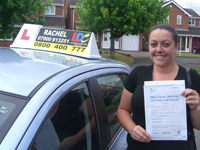 Rachel's calm and professional approach made learning to drive with her enjoyable and ultimately rewarding. 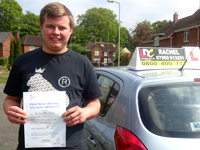 Today I passed my practical driving test (first time), thanks to the continuous, quality instructing by Rachel. From my very first lesson with Rachel there was a sense of a comfortable, yet professional learning environment that enabled me to utilise my lessons to the fullest. When I faced an obstacle in my learning Rachel's patient and reflective personality enabled me to approach and tackle the issue in good time and successfully. My nerves today at the beginning of my test were minimal due to the confidence Rachel had instilled in me over the previous months. I'm so grateful for my pleasant driving experience with Rachel and feel as though I'm fully prepared for my driving career ahead! Rachel was excellent from start to finish. 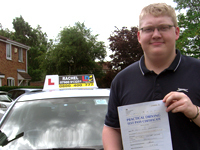 I had a bad experience with another driving instructor and was nervous about finding a new driving instructor. Rachel was recommended by a friend. 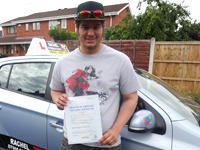 I felt relaxed and comfortable straight away because of her learning skills and ability to see what I needed from her, and the LDC Driving Skills Workbook really helped. I would recommend Rachel to anyone wanting to learn. Very happy; passed 1st time. 10/10 - thanks Rachel for all your help. 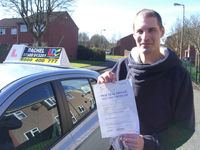 I passed first time thanks to Rachel's time, patience and very professional skills. I had 2 previous instructors who just weren't right for me. 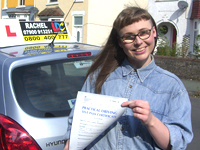 Then I found Rachel who straight away gave me the confidence I needed to pass my test. I enjoyed every lesson and was comfortable and more able to relax and learn as Rachel explained everything! Highly recommended. Thanks a lot! 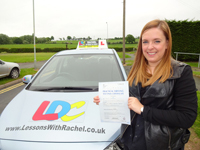 I first had lessons with another instructor, who would cancel at the last minute, so I googled driving schools and found LDC, with Rachel as the instructor in my area. Rachel soon taught me to be confident on the road, and I found that with Rachel’s help and the LDC Driving Skills Workbook and DVD at home to refer to I was soon ready for my test, which I passed first time. If anyone’s looking to be taught properly, look no further than Rachel and LDC. Thanks Rachel, ur the best. Lessons with Rachel are enjoyable and relatively stress free due to her calm and patient nature. Right from my first lesson I was made to feel at ease and relaxed, which erased any fears I previously had about driving. 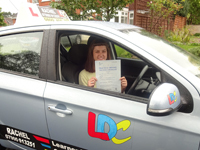 Due to Rachel's thorough approach and the structured LD System, I passed my test first time. It was a pleasure to be taught by Rachel and I thoroughly enjoyed my lessons. 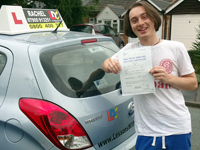 Having started driving lessons in mid-June, I was expecting it to be a waste of time and money as I thought there was no way I could pass a driving test at the end of summer. Needless to say I was wrong, and now I no longer have to deal with smirking bouncers making sly comments about my provisional ID. 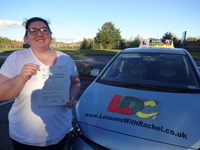 Rachel is a great, highly professional teacher who plans every lesson, answers all your questions and makes sure that you work on the weakest elements of your driving until they are good. She also seems to have unlimited patience - I never felt that she was angry or even annoyed with me, even when it would've been completely justified. The LDC Driving Skills Workbook is very useful, with easy-to-understand diagrams and text explaining all aspects of driving, as well as valuable information on the test itself. The Driving Skills DVD helps you visualise driving so that you can put it into practice in real life. To sum up, I would definitely recommend Rachel and her LDC driving school. Thanks Rachel for all your help! I am absolutely thrilled to have passed my test, however I can't help but feel disappointed that I will no longer have lessons with Rachel. I have had the best experience learning to drive with her and enjoyed every lesson. I couldn't say a bad word even if I tried. She has a wonderful nature and I never had the impression that Rachel was frustrated or tired of repeating herself, even if she had to several times in the space of 20 minutes. Everything was explained clearly and any questions I had were answered with an easy to understand explanation. Rachel adapted to suit my needs as things sometimes went in one ear and out the other in my case. She knew what I was finding difficult and knew how to resolve any issues. I never felt like she had forgotten what I needed to work on by my next lesson. Lesson time was not wasted in the slightest and everything was covered thoroughly. I had a couple of instructors prior to Rachel whose methods I didn't get on with, so I consider myself very fortunate to have been taught by Rachel. I felt confident by the end of the first lesson that Rachel would get me test ready for sure. I could go on and on and on about how great I think Rachel is but you should just find out for yourself. Do the right thing and learn to drive with Rachel. I started lessons with Rachel at the beginning of the year. I felt at ease straightaway which gave me the confidence that I needed to be ready for my test. 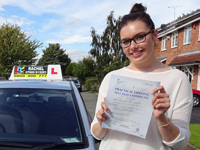 Rachel is patient, understanding and has made learning to drive a pleasure. Having the LDC system made lessons structured and well planned. The DVD and book were a huge help as they prepared me for each lesson. Lessons with Rachel were fantastic! As an extremely nervous learner, Rachel made me feel very at ease and taught in a way which benefitted me. Rachel was able to answer questions and explain things to me in a much better way than I had found with previous instructors. The LDC book and DVD were useful to prepare yourself and recap what you had done in the previous lessons. Each lesson was structured, and targets set in the book help you track your progress and see that you are achieving something new each lesson and not just dragging lessons out. I would highly recommend Rachel and the LDC learner guides. Thank you very much to Rachel for teaching me how to drive. I found Rachel to be kind and patient when it took me a while to get things right. As regards course material, I would recommend getting the LDC Driving Skills Workbook and DVD. Both products were extremely helpful. Having lessons with Rachel really helped me gain the confidence I needed to get to test standard. Rachel was really supportive in helping me to develop my driving skills. She recommended the LDC Driving Skills Workbook and DVD, which enabled me to understand the principles of driving and how to put them into practice. Thank you for all your support Rachel. 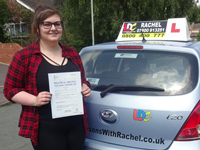 Driving lessons with Rachel are enjoyable as well as incredibly organised. 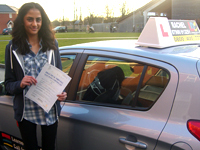 No time is wasted during lessons, and she goes above and beyond what is expected of a typical driving instructor. Rachel is the nicest person you could meet, and she genuinely wants the best for her pupils. She goes out of her way to make things so much easier, and most importantly she listens to what you need. I would definitely recommend Rachel as a driving instructor without a doubt. To help me prepare for my lessons, I was supplied with the LDC Driving Skills Workbook and a 3 disk set of DVDs. The DVDs improve your understanding of the written material as they make everything in the workbook come to life. 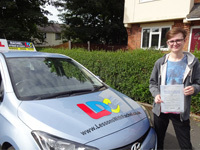 The best thing about learning to drive with LDC is that to a degree you can choose your own lesson path, making practical sessions much more enjoyable. A lot of information is provided, and you are definitely looked after by LDC throughout the training period.